Handel on the Law Live is a 5 hour show. 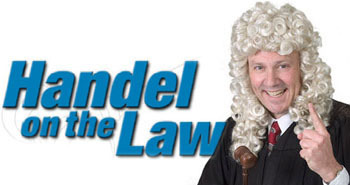 In Handel on the Law, Bill Handel gives terse "marginal legal advice" designed to point callers in the right direction. He often makes fun of callers for getting themselves into their legal predicament, stating bluntly "you have absolutely no case". Still, the show is informative in that it deals with many common legal problems, such as landlord-tenant, child custody, and divorce in an easy-to-understand way. On June 19, 2008, the Hollywood Chamber of Commerce's Walk of Fame Committee announced that Handel would be one of 25 to receive a Star on the Walk of Fame in June 2009. His star was unveiled on June 12, 2009, and is located at 6640 Hollywood Boulevard. Bill is a renowned expert on the legal aspects of Reproductive Technology and has provided legal counsel for several hundred cases of third party reproduction. Bill serves as Director of the Center for Surrogate Parenting, Inc. in Encino, California and Annapolis, Maryland, which has been helping couples become families for over 36 years. He has lectured at universities and medical conferences on several continents and has written articles for numerous medical and legal journals. His expertise on this topic has been featured in articles for the New York Times, Washington Post, Wall Street Journal and other publications and he has appeared on hundreds of television shows including "60 minutes," "Nightline," "48 Hours," "Today," "Frontline," "Crossfire," as well as BBC Television and CNN. (In 1996 Bill hosted a nationally syndicated talk show, "Judge for Yourself."